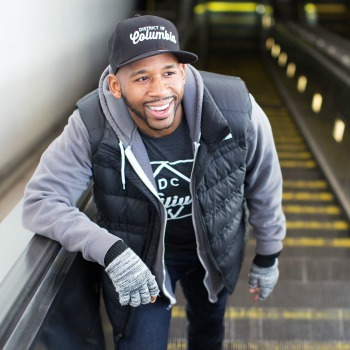 Capitol Riverfront resident and small business owner JC Smith has a passion for Washington, DC. Bailiwick, a clothing company owned by JC and his brother Jeff, makes originally designed and DC-themed apparel. The name Bailiwick comes from old English and means one’s area of authority. JC has found his in creating awesome clothing for District residents, and the Capitol Riverfront provides a home for that passion. Why did you decide to move to the Capitol Riverfront? What were you looking for in a neighborhood and a building? I moved to the Capitol Riverfront about 6 years ago because I wanted to be in a new, fresh part of DC that was still growing and developing, but also had a neighborhood vibe to it. When I moved here, there wasn’t a whole lot here other than Nationals Park, Five Guys, and the CVS. It’s been wonderful to witness the transformation of this neighborhood over the past 6 years, to the point where it’s one of the hottest neighborhoods in the District. I have a condo (co-op) in Capitol Hill Tower and I chose it because I wanted to buy something in this neighborhood, and at the time, there were still a few units available. I think it was then, and still is, a great investment! How did you come up with the idea for Bailiwick? My brother Jeff and I came up with the idea for Bailiwick about 5 years ago, when we were having trouble finding cool, casual DC-themed shirts to wear around town. It seemed that most of the shirts we found were either cheap and touristy, or were simply a shirt for one of the local sports teams. We wanted to do something different, so we came up with Bailiwick. The word Bailiwick is actually an old English word that means your “area of authority, knowledge, or expertise,” and it’s a word we’ve always loved. So through our company, we encourage others here in DC to pursue their passions and embrace their Bailiwick, whatever that may be! Tell us about your clothing company, Bailiwick. Do you operate out of the Capitol Riverfront? At Bailiwick Clothing Company, we make t-shirts, tank tops, hoodies, and hats with symbols and logos that elicit DC pride. We love this town and its people, and I think our shirts represent that. We use high-quality blended fabrics, and for the most part, we try to keep our graphics slightly understated. Right now, we’re an online company, so we ship product all over the USA, but we don’t yet have a physical location. We also do tons of pop-up events all over DC. In fact, we did over 35 different events, festivals, and pop-ups in 2016, and every single of them took place in the District. We make a point to get around to every quadrant and neighborhood. On a day-to-day basis, we definitely operate out of the Capitol Riverfront; we do a lot of work out of my residence, but you’ll also catch us at Philz Coffee, Lot 38, and Starbucks often! As someone with a passion for all things DC, what is one thing that the Capitol Riverfront offers that you can’t get anywhere else in the City? There is so much that you can do here at the Capitol Riverfront because it’s one of the most fun and happening parts of DC. Where else in DC can you walk from a free Friday night concert on the water to a food truck festival (Truckeroo), and then to a Major League baseball game? There are great restaurants here, events like Tour de Fat, Side Yards and the Thursday night movies, and even an ice skating rink. This place has it all, and yet it's still walkable, livable, and kid-friendly. Also, quiet as kept, its one of the most connected parts of the city. With neighborhood's close proximity to the interstate, you can quickly get to Virginia, Maryland, or other parts of the District. Living here, you’re easily connected to Capitol Hill, Southwest, and Anacostia. Bryce Harper has endorsed your shirts and worn them in interviews. How did you make that happen? With the opening of the DC United Stadium in 2018, do you plan on making any shirts geared toward their fans and players? The Bryce thing was so awesome - it really helped put us on the map. I don’t want to give away all our secrets, but we have some good connections with the team, and Bryce ended up taking a liking to our shirts. In fact, by the end of the year, we had about 6-8 other Nats players wearing them too. And yes, we’re very excited about the DC United stadium opening in a few years! We already have a few black and red DC United colored shirts in our portfolio, but have no fear, we’ve got a few more designs up our sleeve for those die-hard DC United fans. For those who have just moved to the neighborhood, take the time to visit all the establishments here and immerse yourself in the neighborhood. There are so many great restaurants, bars, and businesses here that are flourishing - and most of them are staffed and frequented by your friends and neighbors, so there’s a great chance one of them will soon be your favorite neighborhood spot. Oh and also read JDLand.com or follow JDLand on twitter. It’s the best resource for all things Capitol Riverfront. And if you’re thinking about moving to the Capitol Riverfront, what are you waiting for? Now is the time - at least get here before the Whole Foods opens. Bailiwick would make the perfect gift for that DC fanatic in your life. How can our readers in the Capitol Riverfront order your clothes for the holidays? They can go to www.bailiwickclothing.com. Right now, we’re having a holiday sale where all our tank tops and many shirts are $15 each, and shipping is free. Get that DC fanatic something nice and be a holiday hero!